If you're looking for the best cheap smartphones available today in 2019 then you've come to the right place. Welcome to T3's line-up of the very best cheap phones available, a carefully curated guide that lists the best cheap mobile phones out there. We think the Honor Play is the best cheap smartphone you can buy. It carries all the prestige and premium build quality of a flagship, as well as simply awesome mobile gaming chops, but without the massive price tag. Of course, the Honor Play may not be right for you, especially if you want something super cheap, or have an affinity with another maker, so we've collected nine other excellent budget phones for you to choose from, too. We've also included some handy buying advice to help you find the best cheap smartphone for you. Flagship smartphones are great, they're lightning fast, well designed, and offer a ton of extra features. But they come at a cost, and that cost is a lot of money. If you're looking for an alternative to one of those expensive handsets or the best smartphone for kids, for example - we've got you covered. While the phones in this list are all more affordable — we've only selected the very best phones which don't scrimp on hardware, design, or features. We're only recommending the cheap smartphones we'd be happy to use. We think just because you're paying less, doesn't mean you should have a phone that feels cheap. You should also look out for premium features from more expensive smartphones, such as a fingerprint sensor, waterproofing, or an excellent camera. The Honor Play, despite being pitched as a mobile gaming powerhouse, is actually just a fabulous all-round Android phone that delivers a stunning package for a very, very low price point of only £279.95. Seriously, you get some incredibly tasty technology in the Honor Play, including the rapid Kirin 970 CPU, 4GB of RAM, and a very spacious 6.3-inch FHD+ screen. Solid if not spectacular dual rear cameras and a single selfie camera are partnered with 64GB of internal storage space, while the phone's in-built GPU Turbo tech means that mobile games run incredibly well, too. And, with immersive 7.1 Histen audio and a 89 per cent screen-to-body ratio in play, enjoying those games, or any other media, really is a super enjoyable experience. Simply put, the Honor Play seriously makes you question why anyone would spend more on a mobile phone, which in some flagships means a price 3 or 4 times that of this phone. The ageing but still quality OnePlus 5T is difficult to beat at the bargain-tastic price it has dropped to in 2019. Budget smartphones always claim they can compete with the likes of Google, Samsung and LG, but few ever come close to the mark. The OnePlus 5T, though, gives all three a run for their money by delivering a phone with a fast Snapdragon 835 processor and very generous 6GB of RAM. It's not just the specs that make this phone, either, it's the all aluminium chassis that gives the phone a premium look and feel, and the bezel-less 6-inch display. It isn't as good as the OnePlus 6, or as fast, but at this price point it is still one of the best cheap phones in the world. The Sony Xperia XA1 is a good budget buy with a superb camera sensor (23MP!). It’s a shame the camera software is a little too enthusiastic, though, with some quite over the top image processing taking place at times. Design-wise the phone looks great despite sporting a plastic back plate and the phone looks significantly more mature and premium than a lot of other similarly priced rival devices. Battery life is standard, as too is its 3GB of RAM, however performance is smooth and 720p screen perfectly matched. For that price? One of the best cheap smartphones on the market. Now available for under £300 if you shop around, the Samsung A8 could tempt those who’ve resisted plumping for a second hand Galaxy S8 so far. There are no curved edges here, and even with its glass back it feels noticeably lighter in the hand than the S8, but it does do some awesome things to make up. The A8's camera package, both front and back, is stellar, and the rounded-corner Super-AMOLED screen, coupled with a strong eight-core processor and 4GB RAM, is lurid and quick to respond. Cost savings come in terms of battery and storage, at 3,000mAh and 32GB respectively, which aren't ideal, but overall this is top budget smartphone that's now going for silly money. The Motorola Moto G6 is a phone that does far, far more than its price point suggests, and as such it is among the best affordable phones available to buy right now. The 12MP camera is strong, the phone itself is plenty responsive, it’s clad front and back in glass, and the 1080x2160 screen is punchy and colourful. Storage is a low 32GB, as you’d expect for the price, and the Snapdragon 450 CPU struggles when pushed, so invest an extra few quid in the Amazon-exclusive 64GB/4GB RAM model: you won’t regret it. The 5.8-inch QHD Nokia 8 handset didn’t start in this price bracket. At launch it was £500, and decent with it. Now available for a little under £300, it’s a remarkable phone for the price. Slim and reassuringly weighty, it’s also super-quick thanks to the Snapdragon 835 doing the driving, and comes equipped with 64GB storage and a 13MP dual-sensor rear camera that pulls its weight, plus a 13MP front camera that’s no slouch. Forgive the fact it’s a step behind aesthetically: this is flagship quality made fully affordable, and one of the best cheap smartphones on the market today. Ringing in at only £379, the Huawei Mate 20 Lite makes a pretty damn big splash for a very modest financial outlay, and for our money one of the very best cheap phones going right now. The 3,750 mAh battery, 4GB of RAM, and dual front and rear cameras are great, while the 6.3-inch FHD+ screen offers plenty of real estate. The screen isn't the sharpest around, and the Kirin 710 CPU not the fastest, but at this level of the market the Huawei Mate 20 Lite delivers a top tier package that you would be foolish to ignore if you're shopping with around £350-£400 to spend. Despite being the cheapest phone on our list, the 3V Spectrum from stylish French maker Alcatel packs in a very impressive set of features for a phone that costs just a fiver over a ton. 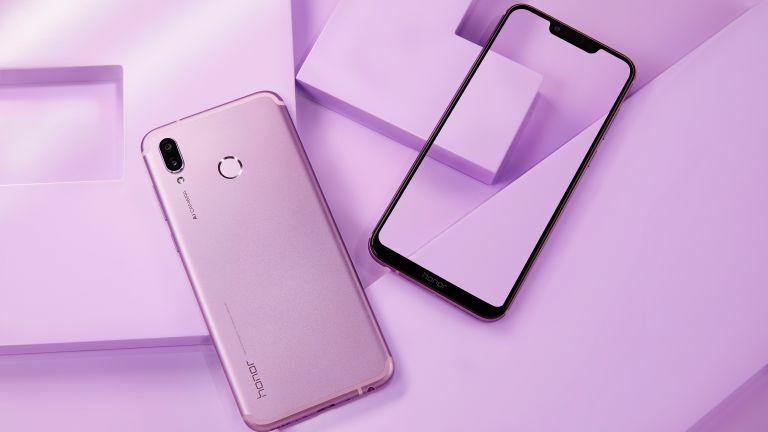 You get a 6-inch, 18:9 screen with 2K resolution, a quad-core CPU, a dual rear camera system (12MP + 2MP), 5MP front selfie camera, and a Face Key facial unlock function. The 3V also comes running Android 8.0 Oreo out of the box. Yes, you only get 16GB of storage space, and only 2GB of RAM, too, but aside from that there is very little to dislike about this glossy 2.5D glass-packing device. It looks bang on trend, feels solid in the hand, and that price makes buying it outright and freeing yourself for a sweet SIM only deal very, very easy. If you want to spend around £100 on a new smartphone then the Alcatel 3V is a great choice. Rounding off our guide to the very best cheap smartphones available today is the phenomenal Honor 8X, a smartphone that delivers a big, bright 6.5-inch LCD 19.5:9 aspect ratio screen, as well as modern, attractive look and feel for a very low price point. The phone's Kirin 710 chipset isn't the fastest going and there's no Android 9.0 Pie out of the box, but the Honor 8X does come with a minimum of 4GB of RAM (certain models comes with 6GB), and more than enough room for apps, games, and media with 64GB and 128GB internal storage drives available. The all glass and metal built, though, in partnership with a solid camera system and competitive 3,750 mAh battery, make this a quality all-round smartphone for those shopping with around £200 in their pocket.